Me in a Liz Lisa shop - heaven! The Japanese are crazy about their styles. If you ever go to Tokyo you'd understand how much time and effort they put into dolling themselves up. From immaculate hair to nails to shoes to headgear... They all look effortlessly stylish! Not an inch of sloppiness. 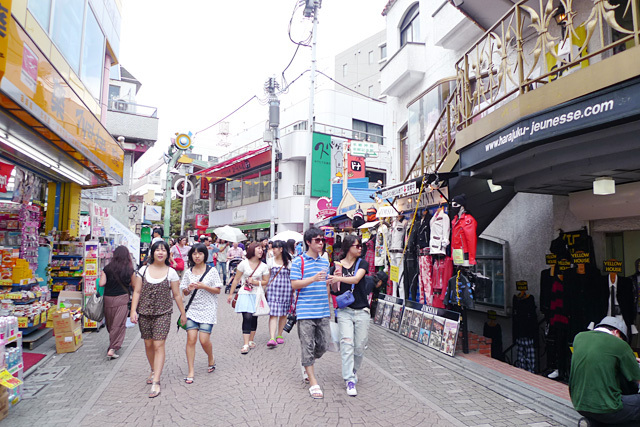 And one of these fashion forward places in Tokyo is the famous Harajuku! Ok fine the people in this photo are not that stylish but it was 40 degrees out and still the Japanese do their layering thing! Madness. But the sad thing is, most of these awesome Japanese labels are only available in Japan, not Singapore. Tangs is bringing Harajuku to Singapore!! Harajuku Street Style Pop-up Store is gonna be launching on our sunny island, bringing not one but FIFTEEN most fashion forward Japanese brands to Singapore! :D Excited! And I get to play dress up! Qiuqiu, Cheesie, Typical ben and I were invited to pick from a range of clothes those we like for a photoshoot! Cheesie came over to my place for the photo-taking so here are my pictures (some with her). Floaty ruffled floral blue top with ruffled high waisted shorts. Very comfortable! Wedged for maximum comfort. OMG I love them! Cheesie is in what she calls an Otona style, meaning adult. The look is usually preppy and vintage-looking, if I'm not wrong. Autumn tube outfit that can be worn as a dress or as a skirt (if you are tall enough - I am not). Hope you like these pictures!! If you want the clothes, be sure to make a trip down to Tangs Orchard! Want to WIN stuff instead?? Be a fan of the Harajuku Street Style facebook page HERE. You will soon see they have two contests for you to join (not on the page yet - like the page to be the first to be updated! *kiasu*). One of them is a style-naming contest and the other is a fashionista contest! These are the sponsors!! Cool right?! So remember to go like the page!